Resepi Coconut Mango Smoothie. Salah satu resepi jus kegemaran saya adalah Coconut Mango Smoothie. Dengan keenakan rasa kelapa ditambah pula dengan haruman buah mangga, menjadikan minuman lebih sedap diminum. Dahaga dan rasa haus pasti hilang dengan resepi Coconut Mango Smoothie ini. Bagaimana cara buat coconut mango smoothie? For added nutrition, add flax oil or wheat germ. 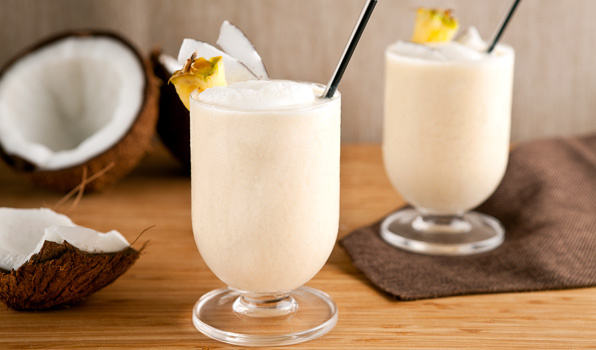 Add coconut water, mango juice, banana, yogurt, and ice to blender. Puree until smooth. Pour into glasses and garnish, as desired. Bake coconut in preheated 400 degree F. oven for 15 to 20 minutes. The coconut shell will crack and be much easier to work with. Let cool completely. With a clean screw driver or metal skewer, pierce hole through soft eye of coconut. Drain coconut water and strain before using. To speed up the process, use a clean drill and drill another hole in the coconut. The extra air hole, will make the coconut water pour out faster. To crack coconut, break apart with hammer. Dislodge meat from shell with a paring knife.